Cedar Elm Ranch raises grass-fed lambs in Central Texas. When purchasing a whole lamb, Cedar Elm Ranch will deliver it live to a nearby butcher. You can discuss directly with the butcher which cuts you’d like. Here is an example delivery. See our Recipes by Cut page for inspiration. Lambs are sold for $7.50/lb hanging weight, which is the weight after they have been slaughtered. A rough estimate of hanging weight is 50% their live weight, so a 70lb lamb would be about 35lb hanging, and result in about 35lbs of finished cuts. You’ll also pay the butcher’s processing fee. 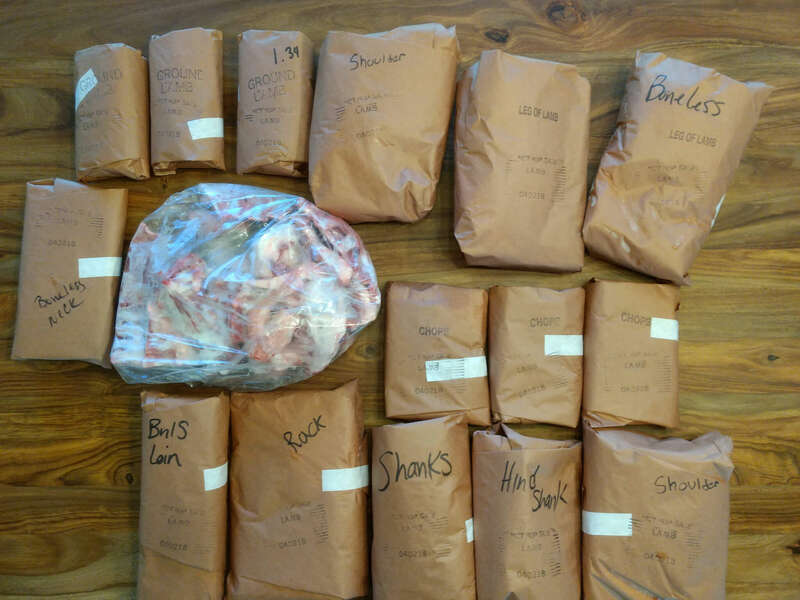 Dutchman’s Market in Fredericksburg TX charges a $15 kill fee and $0.75/lb for butcher paper (shown below). Taylor Meat Company in Taylor TX charges $70 kill fee and $90 to cut and wrap. If you’d like to discuss purchasing a whole lamb, please fill out the contact form below and we can discuss options and timing. Lambs are typically ready between February and June.